May 5th Election and Referendum. Results! 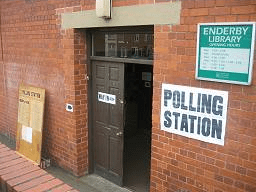 In common with others across the district, Enderby residents were urged to turn out and vote in the District Council elections on Thursday May 5th. In the event, voter turn-out was pretty moderate. Officers at the polling station at the Civic Centre King Street Enderby described the day as quiet. Unless they’ve been on another planet for the past few months, no-one could have been unaware that this election also needed their vote on whether to adopt a new voting system, A.V., as against the existing ‘First Past the Post’ arrangement. At 5.30pm on Friday 6th the National trend appeared to be ‘NO’ to changing the voting system to A.V. by a measure of around 70% to 30%. Full result of the A.V. Referendum is expected around 8pm Friday 6th. One of the big issues in the election was the plan for more than 4,200 homes around Lubbesthorpe which, it is said, will create a new small town in the corridor of countryside between the A47 and the M69 roughly equivalent in size to Market Harborough. MPs and local councillors have said they will fight the planned development and campaign group, Leicester Forest East Residents’ Action Group, has helped organise local resident opposition. Other issues that have coloured the local political landscape have been the development of ‘green-wedge’ land for the development of the Enderby Park and Ride terminal, attempts to construct a ‘brick-crushing’ plant close to the centre of Enderby village and the ongoing issue of traffic/noise level on routes through the Enderby area with the consequent impact on the quality of life for residents in the Enderby area. The district as a whole covers areas to the west and south of Leicester including Blaby, Leicester Forest East, Glenfield, Glen Parva, Broughton Astley and Countesthorpe.